White-bellied Sunbird ( Cinnyris talatala fam. Nectariniidae) Kruger Park Birds & Birding. The White-bellied Sunbird (Latin name Cinnyris talatala) is described in Roberts Birds of Southern Africa, 7th Edition. This bird has a unique Roberts number of 787 and you will find a full description of this bird on page 993 also a picture of the White-bellied Sunbird on page 1008. The White-bellied Sunbird belongs to the family of birds classified as Nectariniidae. According to the Percy FitzPatrick Institute of African Ornithology the White-bellied Sunbird is also known by these other names: Southern White-bellied Sunbird, White-breasted Sunbird. In the previous edition of Roberts (ie 6th edition) the White-bellied Sunbird was called the . The Robert's 7 Latin name for White-bellied Sunbird has changed from Nectarinia talatala in Robert's 6 to Cinnyris talatala. 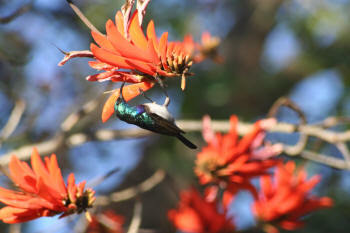 In terms of distribution of the White-bellied Sunbird in the Kruger National Park you may not see it in all areas. White-bellied Sunbird : see above distribution map. This bird has normally proportioned leg length and a long bill. The White-bellied Sunbird feeds in typical sunbird fashion clasping the edge of the flower or taking up a perch close to the flower into which it pokes its long curved bill. It moves around quickly from flower to flower. You can expect to see White-bellied Sunbird in flocks, or pairs or as single birds.